THE THIRD, OR MASTER MASON'S DEGREE. acknowledged as the third most distinguished man then living, and in many respects the greatest man in the world, should pass off the stage of action in the presence of King Solomon, three thousand three hundred grand overseers, and one hundred and fifty thousand workmen, with whom he had spent a number of years, and neither King Solomon, his bosom friend, nor any other among his numerous friends even recorded his death or anything about him. I make these remarks now, hoping that it may induce some person who has time and capacity to investigate the subject, and promulgate the result of his investigation. I shall let the subject rest where it is, at present; it is not intended that it should form any part of this little volume. The principal object of this work is to lay before the world a true history of Freemasonry, without saying anything for or against it. 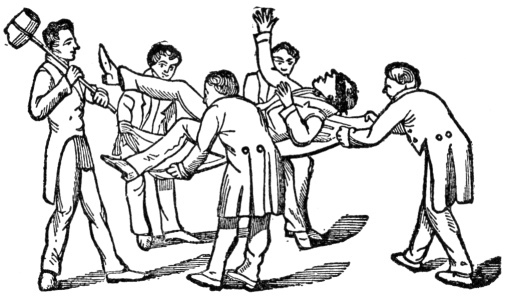 [the manner of preparing him is particularly explained in the lecture] where he gives three distinct knocks, when the Senior Warden rises and says, "Worshipful, while we are peaceably at work on the third degree of Masonry, under the influence of humanity, brotherly love, and affection, the door of our lodge appears to be alarmed." The Master to the Senior Deacon, "Brother Senior, enquire the cause of that alarm." answered by one within, when the door is partly opened and the Junior Deacon asks, "Who comes there? Who comes there? Who comes there?" The Senior Deacon answers, "A worthy brother who has been regularly initiated as an Entered Apprentice Mason, passed to the degree of a Fellow Craft, and now wishes for further light in Masonry by being raised to the sublime degree of a Master Mason." Junior Deacon to Senior Deacon, "Is it of his own free will and accord he makes this request?" Junior Deacon to Senior Deacon, "Is he duly and truly prepared." Junior Deacon to Senior Deacon, "Is he worthy and well qualified?" Junior Deacon to Senior Deacon, "Has he made suitable proficiency in the preceding degrees?" Junior Deacon to Senior Deacon, "By what further rights does he expect to obtain this benefit?" Ans. "By the benefit of a pass-word." Junior Deacon to Senior Deacon, "Has he a pass-word?" Ans. "He has not, but I have got it for him." The Junior Deacon to the Senior Deacon, "Will you give it to me.?" The Senior Deacon then whispers in the ear of the Junior Deacon, "Tubal Cain." Junior Deacon says, "The pass is right. Since this is the case, you will wait till the Worshipful Master be made acquainted with his request and his answer returned." The Junior Deacon then repairs to the Master and gives three knocks as at the door; after answering of which, the same questions are asked and answers returned as at the door, when the Master says, "Since he comes endued with all these necessary qualifications, let him enter this worshipful lodge, in the name of the Lord, and take heed on what he enters." him enter this worshipful lodge, in the name of the Lord, and take heed on what he enters." 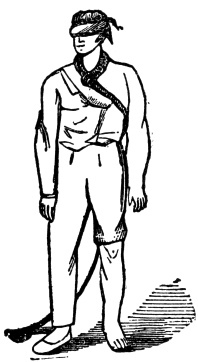 In entering, both points of the compass are pressed against his naked right and left breasts, when the Junior Deacon stops the candidate and says, "Brother, when you first entered this lodge, you were received on the point of the compass, pressing your naked left breast, which was then explained to you; when you entered it the second time you were received on the angle of the square, which was also explained to you; on entering now you are received on the two extreme points of the compass, pressing your right and left breasts, which are thus explained: As the most vital parts of man are contained between the two breasts, so are the most valuable tenets of Masonry contained between the two extreme points of the compass, which are virtue, morality, and brotherly love." be darkened, and the doors shall be shut in the streets; when the sound of the grinding is low, and he shall rise up at the voice of the bird, and all the daughters of music shall be brought low. Also, when they shall be afraid of that which is high, and fears shall be in the way, and the almond tree shall flourish, and the grasshopper shall be a burden, and desire shall fail; because man goeth to his long home, and the mourners go about the streets; or ever the silver cord be loosed, or the golden bowl be broken, or the pitcher be broken at the fountain, or the wheel at the cistern. Then shall the dust return to the earth as it was; and the spirit shall return unto God who gave it." The conductor and candidate halt at the Junior Warden in the South, where the same questions are asked and answers returned as at the door. He is then conducted to the Senior Warden in the west, where the same questions are asked and answers returned as before; from whence he is conducted to the Worshipful Master in the east, who asks the same questions and receives the same answers as before, and who likewise asks the candidate from whence he came. and whither he is traveling. Ans. "From the west, and traveling to the east"
"Why do you leave the west, and travel to the east?" Ans. "In search of more light." The Master then says to the Senior Deacon, "You will please conduct him back to the west, from whence he came and put him in care of the Senior Warden, and request him to teach the candidate how to approach the east, by advancing upon three upright, regular steps to the third step, his feet forming a square, his body erect at the altar, before the Worshipful Master, and place him in a proper position to take upon him the solemn oath or obligation of a Master Mason." The Master then comes to the candidate and says, "Brother, you are now placed in a proper position [the lecture explains it] to take upon you the solemn oath or obligation of a Master Mason, which I assure you, as before, is neither to affect your religion or politics. 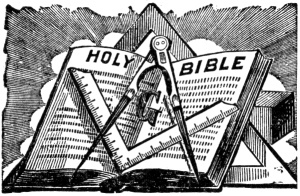 If you are willing to take it, repeat your name and say after me:"
of Almighty God, and this worshipful lodge of Master Masons, dedicated to God, and held forth to the holy order of St. John, do hereby and hereon most solemnly and sincerely promise and swear, in addition to my former obligations, that I will not give the degree of a Master Mason to any of an inferior degree, nor to any other being in the known world, except it be to a true and lawful brother or brethren Master Masons, within the body of a just and lawfully constituted lodge of such; and not unto him nor unto them whom I shall hear so to be, but unto him and them only whom I shall find so to be, after strict trial and due examination, or lawful information received. Furthermore do I promise and swear, that I will not give the Master's word which I shall hereafter receive, neither in the lodge nor out of it, except it be on the five points of fellowship, and then not above my breath. Furthermore do I promise and swear, that I will not give the grand hailing sign of distress except I am in real distress, or for the benefit of the Craft when at work; and should I ever see that sign given or the word accompanying it, and the person who gave it appearing to be in distress I will fly to his relief at the risk of my life, should there be a greater probability of saving his life than losing my own. Furthermore do I promise and swear that I will not wrong this lodge, nor a brother of this degree to the value of one cent, knowingly, myself, or suffer it to be done by others, if in my power to prevent it. Furthermore do I promise and swear, that I will not be at the initiating, passing and raising a candidate at one communication, without a regular dispensation from the Grand Lodge for the same. sister, or daughter. I knowing them to be such, nor suffer it to be done by others, if in my power to prevent it. Furthermore do I promise and swear that I will support the constitution of the Grand Lodge of the state of ——, under which the lodge is held, and conform to all the by-laws, rules, and regulations of this or any other lodge of which I may at any time hereafter become a member. Furthermore do I promise and swear that I will obey all regular signs, summonses, or tokens given, handed, sent, or thrown to me from the hand of a brother Master Mason, or from the body of a just and lawfully constituted lodge of such, provided it be within the length of my cable-tow. Furthermore do I promise and swear that a Master Mason's secrets, given to me in charge as such, and I knowing them to be such, shall remain as secure and inviolable in my breast as in his own, when communicated to me, murder and treason excepted; and they left to my own election. Furthermore do I promise and swear that I will go on a Master Mason's errand whenever required, even should I have to go bare-foot and bare-headed, if within the length of my cable-tow. Furthermore do I promise and swear that I will always remember a brother Master Mason when on my knees offering up my devotions to Almighty God. Furthermore do I promise and swear that I will be aiding and assisting all poor, indigent Master Masons, their wives and orphans, wheresoever disposed around the globe, as far as in my power, without injuring myself or family materially. should be, were I ever to prove willfully guilty of violating any part of this my solemn oath or obligation of a Master Mason. So help me God, and keep me steadfast in the due performance of the same. The Master then asks the candidate, "What do you most desire?" The candidate answers after his prompter, "More light." is given by raising both hands and arms to the elbows, perpendicularly, one on each side of the head, the elbows forming a square. The words accompanying this sign, in case of distress, are, "O Lord, my God! is there no help for the widow's son?" As the last words drop from your lips, you let your hands fall, in that manner best calculated to indicate solemnity. King Solomon is said to have made this exclamation on the receipt of the information of the death of Hiram Abiff. Masons are all charged never to give the words except in the dark, when the sign cannot be seen. ½ Note.—The sign as now given is shown on the next page. of Hiram's death, and work accordingly in their lodges. Others say the sign was given and the exclamation made at the grave, when Solomon went to raise Hiram, and, of course, they work accordingly; that is to say, the Master who governs the lodge, holding the latter opinion, gives the sign, etc., at the grave, when he goes to raise the body, and vice versa. 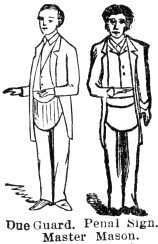 The Due Guard is made by holding both hands in front, palms down, as shown in cut, and alludes to the manlier of holding the hands while taking the obligation of Master Mason. The Penal Sign is given by putting the right hand to the left side of the bowels, the hand open, with the thumb next to the belly, and drawing it across the belly, and letting it fall; this is done tolerably quick. This alludes to the penalty of the obligation: "Having my body severed in twain," etc. See page 75. After the Master has given the sign and due guard, which does not take more than a minute. he says, "Brother, I now present you with my right hand, in token of brotherly love and affection, and with it the pass-grip and word." The pass-grip is given by pressing the thumb between the joints of the second and third fingers where they join the hand; the word or name is Tubal Cain. It is the pass-word to the Master's degree. The Master, after giving the candidate the pass-grip and word, bids him rise and salute the Junior and Senior Wardens, and convince them that he is an obligated Master Mason, and is in possession of the pass-grip and word. While the Wardens are examining the candidate, the Master returns to the east and gets an apron, and, as he returns to the candidate, one of the Wardens (sometimes both) says to the Master, "Worshipful. we are satisfied that Bro. —— is an obligated Master Mason." The Master then says to the candidate, "Brother, I now have the honor to present you with a lamb-skin or white apron, as before, which I hope you will continue to wear, with credit to yourself and satisfaction and advantage to the brethren; you will please carry it to the Senior Warden in the west, who will teach you how to wear it as a Master Mason. fall down before, in its natural and common situation. The Master returns to the seat and the candidate is con. ducted to him. Master to candidate, "Brother, I perceive you are dressed, it is of course necessary you should have tools to work with. I will now present you with the working tools of the Master Mason, and explain their use to you. The working tools of a Master Mason are all the implements of Masonry indiscriminately, but more especially the trowel. The trowel is an instrument made use of by operative masons to spread the cement which unites a building into one mass, but we, as Free and Accepted Masons, are taught to make use of it for the more noble and glorious purpose of spreading the cement of brotherly love and affection; that cement which unites us into one sacred band or society of friends and brothers, among whom no contention should ever exist but that noble contention, or, rather, emulation, of who can best work or best agree. I also present you with three precious jewels; their names are Humanity, Friendship, and Brotherly Love. Brother, you are not invested with all the secrets of this degree, nor do I know whether you ever will be until I know how you withstand the amazing trials and dangers that await you. us from the evil intentions of our enemies, and support us under the trials and afflictions which we are destined to endure while traveling through this vale of tears. Man that is born of a woman is of few days and full of trouble. He cometh forth as a flower, and is cut down, he fleeth also as a shadow, and continueth not. Seeing his days are determined, the number of months are with thee, thou hast appointed his bounds that he cannot pass; turn from him that he may rest, till he shall accomplish his day. For there is hope of a tree, if it be cut down, that it will sprout again, and that the tender branch thereof will not cease. But man dieth and wasteth away; yea, man giveth up the ghost, and where is he? As the waters fall from the sea, and the flood decayeth and drieth up, so man lieth down and riseth not up till the heavens shall be no more. Yet, O Lord, have compassion on the children of thy creation; administer unto them comfort in time of trouble, and save them with an everlasting salvation. Amen, so mote it be." They then rise, and the conductor says to the candidate: "Brother, in further imitation of our Grand Master, Hiram Abiff, let us retire at the south gate." They then advance to the Junior Warden [who represents Jubela, one of the ruffians], who exclaims, "Who comes here?" [The room is dark, or the candidate hoodwinked.] The conductor answers, "Grand Master, Hiram Abiff." to the floor; on which one of them exclaimed, "What shall we do? We have killed our Grand Master, Hiram Abiff!" Another answers, "Let us carry him out of the east gate, and bury him in the rubbish till low twelve, and then meet and carry him a westerly course and bury him." The candidate is taken up in a blanket, on which he fell, and carried to the west end of the lodge, and covered up and left; by this time the Master has resumed his seat [King Solomon is supposed to arrive at the temple at this juncture] and calls to order, and asks the Senior Warden the cause of all that confusion. The Senior Warden answers, "Our Grand Master, Hiram Abiff, is missing, and there are no plans or designs laid down on the Trestle-board for the Craft to pursue their labors." The Master, alias King Solomon, replies, "Our Grand Master missing! Our Grand Master has always been very punctual in his attendance; I fear he is indisposed; assemble the Crafts, and search in and about the temple, and see if he can be found. 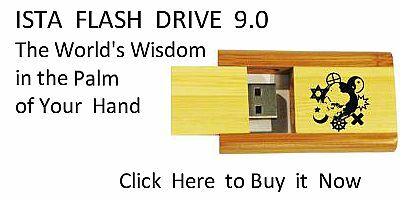 They all shuffle about the floor awhile, when the Master calls them to order and asks the Senior Warden, "What success?" [paragraph continues] He answers, "We cannot find our Grand Master, my lord." The Master then orders the Secretary to call the roll of workmen and see whether any of them are missing. The Secretary calls the roll and says, "I have called the roll, my lord, and find that there are three missing, viz. : Jubela, Jubelo, and Jubelum." His lordship then observed, "This brings to my mind a circumstance that took place this morning. Twelve Fellow Crafts, clothed in white gloves and aprons, in token of their innocence, carne to me and confessed that they twelve, with three others, had conspired to extort the Master Mason's word from their Grand Master, Hiram Abiff, and in case of refusal to take his life. They twelve had recanted, but feared the other three had been base enough to carry their atrocious designs into execution." Solomon then ordered twelve Fellow Crafts to be drawn from the bands of the workmen, clothed in white gloves and aprons, in token of their innocence, and sent three east, three west, three north, and three south in search of the ruffians, and if found to fetch them forward. Here the members all shuffle about the floor awhile, and fall in with a reputed traveler, and inquire of him if he had seen any traveling men that way; he tells them that he has seen three that morning near the coast of Joppa, who from their dress and appearance were Jews, and who were workmen from the temple, inquiring for a passage to Ethiopia, but were unable to obtain one in consequence of an embargo which had recently been laid on all the shipping, and had turned back into the country. The Master now calls them to order again, and asks the Senior Warden, "What success?" He answers by relating what had taken place. Solomon observes, "I had this embargo laid to prevent the ruffians from making their escape," and adds, "You will go and search again, and search till you find them, if possible, and if they are not found the twelve who confessed shall be considered as the reputed murderers and suffer accordingly." First, Jubela—"O that my throat had been cut across, my tongue torn out, and my body burled in the rough sands of the sea, at low water mark, where the tide ebbs and flows twice in twenty-four hours, ere I had been accessory to the death of so good a man as our Grand Master, Hiram Abiff!" The second, Jubelo—"O that my left breast had been torn open and my heart and vitals taken from thence and thrown over my left shoulder, carried into the valley of Jehosaphat, and there to become a prey to the wild beasts of the field and vultures of the air, ere I had conspired the death of so good a man as our Grand Master, Hiram Abiff!" The third, Jubelum—"O that my body had been severed in two in the midst, and divided to the north and south, my bowels burnt to ashes in the center, and the ashes scattered by the four winds of heaven, that there might not the least track or remembrance remain among men, or Masons, of so vile and perjured a wretch as I am; ah, Jubela and Jubelo, it was I that struck him harder than you both. It was I that gave him the fatal blow; it was I that killed him outright;"
"What shall we do; there are three of them, and only three of us?" "It is," said one, in reply; "our cause is good, let us seize them." "Well, Jubela, what have you got to say for yourself, guilty or not guilty?" "Jubelo, guilty or not guilty?" "Jubelum, guilty or not guilty?" "Take them without the west gate of the temple and have them executed according to the several imprecations of their own mouths." nor a key to it. O Lord, my God, is there no help for the widow's son?" to ear. This is done by putting the inside of your right foot to the inside of the right foot of the person to whom you are going to give the word, the inside of your knee to his, laying your right breast against his, your left hands on the back of each other, and your mouths to each other's right ear (in which position alone you are permitted to give the word), and whisper the word Mahhahbone. Master to candidate. "Brother, foot to foot teaches you that you should, whenever asked, go on a brother's errand, if within the length of your cable-tow, even if you should have to go barefoot and bareheaded. Knee to knee, that you should always remember a Master Mason in your devotions to Almighty God. Breast to breast, that you should keep the Master Mason's secrets, when given to you in charge as such, as secure and inviolable in your breast as they were in his own before communicated to you. Hand to back, that you should support a Master Mason behind his back as before his face. Mouth to ear, that you should support his good name as well behind his back as before his face." "This brings to my mind a circumstance that took place this morning. Twelve Fellow Crafts came to me, dressed in white gloves and aprons in token of their innocence, and confessed that they twelve with three others had conspired to extort the Master Mason's word from their Grand Master, Hiram Abiff, and in case of his refusal to take his life; they twelve had recanted, but feared the other three had been base enough to carry their atrocious design into execution." and after making no further discovery, they returned to the Temple and reported to Solomon the result of their pursuit and inquiries. On which Solomon directed them to go and search again, and search until they found their Grand Master, Hiram Abiff, if possible, and if he was not found, the twelve who had confessed should be considered as the murderers and suffer accordingly. was I that gave him the fatal blow! It was I that killed him outright!" On which they rushed forward, seized, bound, and carried them up before King Solomon, who, after hearing the testimony of the three Fellow Crafts, and the three ruffians having plead guilty, ordered them to be taken out at the west gate of the Temple and executed agreeable to the several imprecations of their own mouths. King Solomon then ordered fifteen Fellow Crafts to be selected from the bands of the workmen, clothed with white gloves and aprons, in token of their innocence, and sent three east, three west, three north, three south and three in and about the Temple, in search of the body of their Grand Master, Hiram Abiff, and the three that traveled a westerly course found it under that sprig of cassia, where a worthy brother sat down to rest and refresh himself; and on removing the earth till they came to the coffin, they involuntarily found their hands raised, as herein before described, to guard their nostrils against the offensive effluvia that arose from the grave. It is also said that the body had lain there fourteen days, some say fifteen, The body was raised in the manner herein before described, carried up to the Temple, and buried as explained in the closing clauses of the lecture. Not one third part of the preceding history of this degree is ever given to a candidate. A few general, desultory, unconnected remarks are made to him, and he is generally referred to the manner of raising, and the lecture, for information as to the particulars. Here follows a charge which ought to be and sometimes is delivered to the candidate after hearing the history of the degree. An address to be delivered to the candidate after the history has been given. and to guard them against breach of fidelity. To preserve the reputation of the fraternity, unsullied, must be your constant care—and for this purpose it is your province to recommend to your inferiors, obedience and submission; to your equals, courtesy and affability; to your superiors, kindness and condescension. Universal benevolence you are always to inculcate; and by the regularity of your own behavior, afford the best example for the conduct of others less informed. The ancient landmarks of the order, entrusted to your care, you are carefully to preserve; and never suffer them to be infringed, or countenance a deviation from the established usages and customs of the fraternity. Your virtue, honor, and reputation are concerned in supporting with dignity the character you now bear. Let no motive, therefore, make you swerve from your duty, violate your vows, or betray your trust; but be true and faithful, and imitate the example of that celebrated artist whom you this evening represent; thus you will render yourself deserving the honor which we have conferred, and merit the confidence that we have reposed." Here follows the lecture on this degree, which is divided into three sections. Next: First Section of the Master Mason Lecture.